This is the seventh track of Dr. Leonard Horowitz's Solfeggio Eclectica Album. The following chart provides information regarding the indications for this frequency therapy recording. This track follows the fifth chakra therapy track titled "Blue Moana." That composition is the sixth track of the album. The sixth track is recorded in the Solfeggio frequency 639Hz. 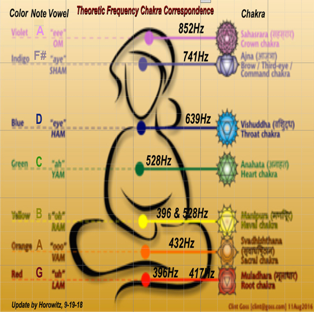 Overactive throat chakras are commonly seen in people who speak before they think, causing hurtful arguments. 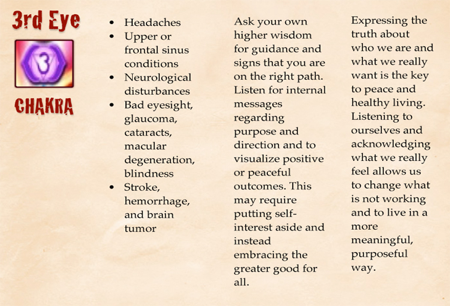 Weak throat chakras disable people from speaking their truth clearly and assertively. Throat chakra imbalances are also seen when people have trouble articulating their thoughts clearly. Miscommunications and frustrations result. Click the button below to add the Ego/Brainwashing- Sixth Chakra Therapy - Solfeggio Frequency 741Hz (Mp3 Download) to your wish list.